Ha! I just got that! So I'm a pretty big Berni Wrightson fan, but his Swamp Thing work is a little before my time. I've decided to catch up on it now, in my 40s. Hooray for gainful employment! First off, I'll just say, I'm really enjoying Roots of the Swamp Thing, which compiles the first 13 issues of DC's original Swamp Thing run. It's a soft cover, semi-gloss affair with what looks like the original colors. This is not the "remastered" edition, this is likely pretty close to the original but on nicer paper. This collection also incudes the original impetus for the Swamp Thing character that appeared in House of Secrets #92. There are, I think, a couple reasons why Swamp Thing has become the stuff of comics legends. 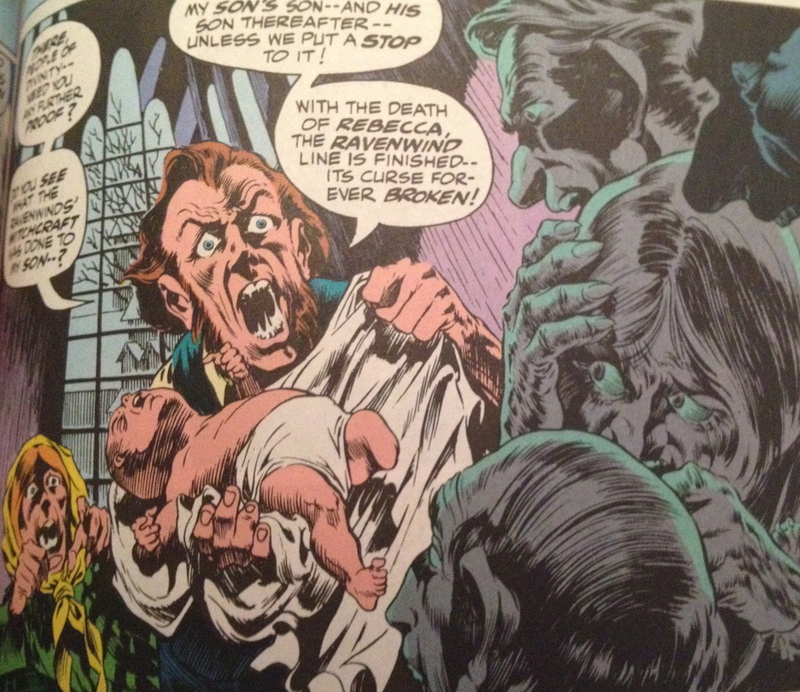 The first is Berni Wrightson's terrific work on issues 1-11. My first connection to Wrightson came from reprints of the spectacular horror work he did for Creepy. It's some of the finest comic work you're ever likely to see, and I highly recommend it. Wrightson's Swamp Thing work is not his best and tends to be a bit uneven, especially early on — and it's certainly not on par with his Creepy work — but it's still some of the best comic art ever made. The work is detailed and moody with liberal flashes of Wrightson gothic brilliance. The first issue is the weakest both in terms of artwork and writing. It's almost as if both Wrightson and the writer, Len Wein, didn't care much about the origin of the character, like they just wanted to get into the stories. The drawing is well below Wrightson's abilities, as evidenced by all the books that follow. It's odd and jarring to see him make such weak work when you know his potential. The origin tale itself also lacks the proper character development and tension to make it great. It's full of unnecessary and confusing plot twists that take you out of the story and really weaken the mythology of the character. What could've been a powerful backstory that informed a character with depth and nuance ends up being a fairly typical and bland introduction to a character that only later, over time, will become interesting. Though the origin story is a missed opportunity, the book quickly picks up in the second issue. Here the artwork begins to shine in the way only Berni Wrightson can, which is to say darkly, I suppose. Starting with issue #2 Wrightson's art is back on track and we see him basking in the glory of fabulously horrific creatures the likes of which I've not seen before or since in comicdom. Swamp Thing, at its heart, is really about a journey, both physical and philosophical. Issue #2 begins the Swamp Thing's journey, and it's in this journey that we begin to build up a knowledge of and fondness for the character. As Swamp Thing tries to make his way home, both literally and spiritually, we see how he responds to encounters with all manner of being, and it's these responses that inform our understanding of the character. This journey, which takes our hero to strange and exotic lands, also sets the stage for the perfect sorts of environs that Wrightson's art revels in. So we get lots of great, gothic set pieces rendered in his inimitable style. It's a lot of fun! The other thing that sets Swamp Thing apart from other comics is the writing. Swamp Thing — not just the character, but the comic itself — is a bit of an odd beast. It's equal parts horror story and super-hero book. Len Wein's writing acknowledges this dichotomy and treads the line expertly. Narration is written in the same sort of highly melodramatic, gothic style you expect from a Creepy story — your standard horror comic fare — and there are even boilerplate classic monsters like Frankenstein and the Werewolf, though with twists. But the Swamp Thing himself is clearly a hero on a hero's journey. It's a strangely compelling blend of dank, utter darkness and, of all things, hope. As the story progresses, we gradually get a clearer sense of Swamp Thing's predicament, of his desires, his frustrations and, ultimately, his selfless and heroic nature. But this is all couched within the conventions of a horror comic. I can't say I've seen anything quite like it. It's really rather brilliant. I've not read Alan Moore's take on Swamp Thing, but I probably will sometime in the not too distant future. I can see how he'd take advantage of the basic ingredients and make it into something even better. There is much untapped potential in the original book. But the raw elements of something wonderful are there. There is horror, but pathos, and the sense of the accidental hero thrust into extraordinary circumstances, making the best of a truly strange and ghastly situation. There is the sense of the underdog, and the feeling that in a horrible world it's often hard to tell wrong from right, good from bad. And there is always the idea that actions speak louder than words, even if sometimes no one is listening. I can see why Swamp Thing is considered a great book. Because it is.